I didn't know you guys did this kind of stuff, it's an awesome surprise. Being new here, I didn't know much about the history of this place so that was interesting to read about. I also liked your suggestions for conveying darkness in horror games. I've had difficulty presenting night in sprite games. I did have a question about completed games. Would games made as a proof of concept (say I was making my first game in html 5 or trying out a new mechanic) be considered completed games or demos? An argument can be made for either, I just didn't know the level of polish expected for finished games (polish levels were brought up in the zine). Of course we could make things more challenging, Lisa, but then the stupider students would be in here complaining, furrowing their brows in a vain attempt to understand the situation. Hmm. I think if it has a clear start and finish, and some kind of score, it will count as a complete game, but someone else will have to comment on that. I should probably remove "Fishing from Afar" as it's probably letting the side down. Other than that I think whatever you're happy with. If you consider it finished and would be happy playing it then it probably fits in completed games. 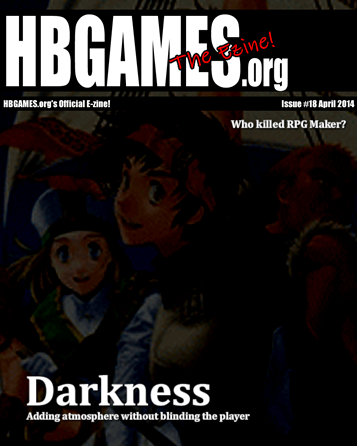 Nice, short reads and a better layout than previous ezines. Looking back at the old ezines they're all universally awful, so it's not difficult. I thought the rpg maker cheat section at the end was a really cute idea.